This year’s free standup reception with a mix and mingle style was well attended and a great opportunity to meet new friends and catch up with old friends. A short Friends’ Annual General Meeting was conducted, with Kate presenting a year end review and Matthew presenting the Treasurer’s report. The highlights of the past year include the $10,000 Graduate Student Award. The election of the executive positions for 2018-19 was completed as follows: The Friends elect Kate Freeman as President, Luca Vanzella as Vice President, Matthew Sharp as Treasurer, Ken Regan as Secretary. 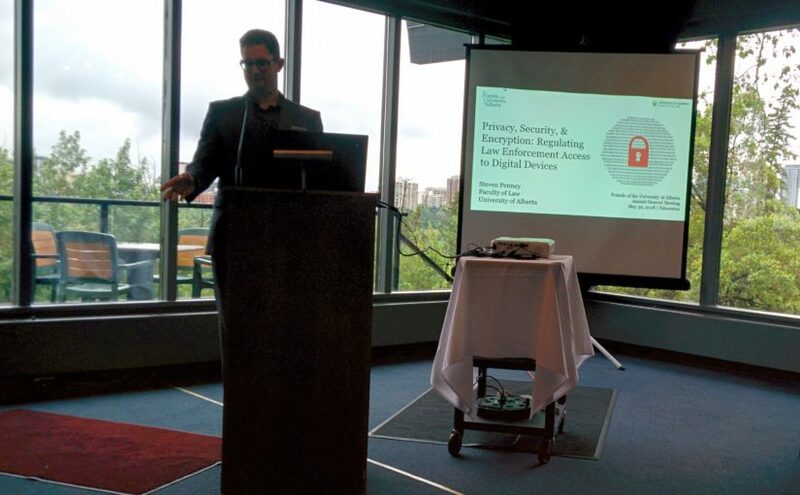 Thanks to our guest speaker Steven Penney, for introducing us to the legal issues around digital devices and reasonable expectation of privacy. The Friends look forward to bringing you more opportunities this summer and into the fall.